Imagine seeing your fully completed swimming pool, deck, and landscaping in your backyard—without turning over a single shovel of dirt. You can. Powerful 3-D technology makes it easier than ever to envision your new outdoor space and to more effectively plan out this rewarding, but complex home improvement project. So many of the questions you may have about your backyard dream can be answered with virtual-reality software now widely used by pool builders across the U.S.
What will the view be like from the spa? Will the rock waterfall look better at the near end of the pool or the far side? Which color of concrete deck will best compliment the color of your home’s exterior? How will features like a stone-faced fire pit or island barbecue grill integrate with the landscaping? These are the kinds of questions for which it would be great to get answers—before construction begins. Those answers—with trials of various design concepts—are what 3-D computer imaging provides. For decades, the swimming-pool design process involved drawing with a ruler, colored pencils, pool-shape templates, and drafting stencils with various geometric shapes. This approach certainly works. 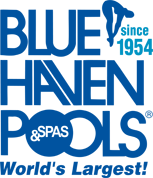 Even today, many veteran pool designers create detailed, stunning project plans for clients to review. 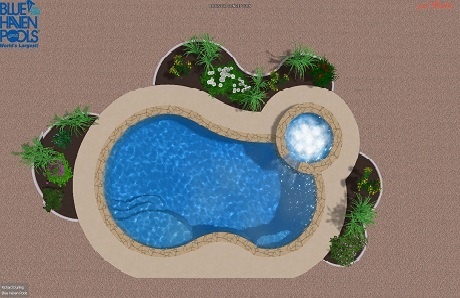 Particularly for simple pool designs, some professionals prefer hand-drawn renderings over digital ones. In some cases, designers rely on these traditional illustrations because they can immediately provide clients with a representation of their new pool on the first visit to their home. However, like so many facets of modern life, the design trend today is to employ technology. More and more, pool professionals are using advanced software to takes those reliable hand illustrations to the next level of simulated, 3-D reality. As a result, pool buyers are enjoying major benefits when collaborating with their pool builders on a new poolscape. Computer programs make it possible for you to see what your new aquatic retreat will look like before even signing a contract for it. Even better: the final creation for your review is not a static graphic, but a multidimensional video that visually represents how your pool, deck, and other features will appear in your backyard—from various angles! The process begins when you arrange for a pool builder to visit your home and provide an estimate for your project. A designer will come out to your property and take initial measurements of your yard. Your designer will ask you a long list of question about how you and your family will use the pool, your preferences for styles, and the kind of features you would like in your pool and in your backyard. Using this information, he or she will begin creating a design plan that resembles your home and adjacent yard area. Designers start out with a 2-D line sketch—just as you might envision with paper and pencils. However, with software and the mouse, your designer will digitally produce the illustration. With the measurements taken from their initial visit, your designer will use the computer mouse to develop a complete plan. The rendering will depict a representation of your home and the backyard’s shape, dimensions, and property line. Your designer can add any existing elements that you will be keeping, such as any trees, plants, or hardscape. If you have a backyard fence, the program can approximate the specific type such as wood, vinyl chain link, or other material. The plan elements will include the pool and all of its features, like a spa, entry steps, tanning ledge, beach entry, and water features, as well as any accessories like railings, a slide, or diving board. Typically, it will also include proposed backyard additions, such as decking, landscaping, and any features like a seating area, landscape box, pergolas, gazebos, pavilions, fireplace, or outdoor kitchen. Once the initial design is mapped out, your designer will use the software to transform the line drawing into a sophisticated 3-D mockup. That’s where the enormous advantages of this state-of-the-art technology really come into play. Let’s take a look at some of those benefits, and why pool builders are using this powerful tool to help homeowners like you during the design process. Create and evaluate free-form concepts. 3-D pool software comes loaded with templates of popular pool shapes, such as Romans, rectangles, or clouds. Designers can take any of those traditional shapes and modify them to suit your likes or to address any particular challenges posed by your yard. However, where the software also shines is in its ability to help your designer efficiently create and revise custom, flowing free-form shapes. These are the concepts that are one-of-a-kind for which no template exists. The best part of this capability is how quickly your designer can show you an array of variations on the concept. In just minutes, you can see multiple alternatives. That makes it much easier to decide which version looks like what you imagined, and best fits with your home and suits your style preferences. Experience a customized, truly “moving” design. Being able to see a 3-D model of your potential poolscape provides you with a visual experience that can help you understand many of the details of how your new backyard resort will look. Going beyond what a flat paper drawing can convey, a digital image provides a 3-D image and even animates what you see. It delivers a video presentation of a virtual tour of your backyard resort. This powerful software gives motion to the design—from flames in the cozy fire pit seating area to the surface of the water glistening in the sunlight. You don’t have to close your eyes and try picturing how the pool and features will come together; the video does it for you. Along with a dazzling visual replication of your dream backyard, the video can even simulate how certain features will sound. That’s right, you can try out various water features and listen to an approximation of the kind of sounds they will make. For example, you can hear how a pair of sleek cascade waterfalls elevated three feet above the pool surface will sound in contrast to a 6-foot tall custom rock grotto. Compared to even an intricately drawn pool plan on paper, the video delivers a much richer, more detailed experience that gives you a better grasp of how the entire plan will come together and how features relate to one another. See a visual replica of your new backyard from various perspectives. After you view the video presentation of your potential new backyard, you will see your new outdoor space and features from different perspectives. The virtual tour function enables you to see your new pool and backyard makeover from various angles and vantage points. See your draft plan from overhead, from your patio area, or from your upstairs balcony. Having these additional perspectives can empower you and your pool builder to make better decisions about your pool plan. Together, you can address functional considerations and flesh out solutions in advance of construction. To illustrate this benefit, let’s take a common issue such as visibility of your pool from inside your home. While you’re washing dishes at the kitchen sink, can you look out the window with a clear line of sight to your kids while they’re in the water? If the answer is no, your designer can adjust the position of the pool. Maybe your backyard has a picturesque backdrop of hills or a lush canyon. You want to take in the view while soaking in your spa. The video can depict what you will see. Perhaps some of the scenery is cut off. As a result, you and your builder decide to raise the spa three-feet above the pool so it affords a better view. 3-D modeling software can even let you view your new swimming pool from inside the structure itself. From the inside, you hone in on your favorite color for an interior finish. Or, you can “go under the water” and see how the proposed position of the entry steps may obstruct easy turns when you swim laps. Another way the program brings your new backyard to life is by depicting it at various times of day. The software approximates the sun’s position throughout each hour. This capability means you can see how your backyard scenery will look at sunrise, sunset, and in the evening. You can even try different color combinations of LED lighting in the pool to see how they will look under the night sky. Review design options quickly and easily. A pool and backyard makeover is a major addition and investment for your home. It’s only natural to want to try out a number of potential design concepts, options, and features. There are so many choices to consider. 3-D software makes it a snap to do so. With a click of the mouse, your designer can make revisions to the plan. For example, say you are unsure about the location of the pool within your yard—maybe you want to try it another five feet away from your backdoor. Instead of having to re-draw the entire design, he or she can just click and drag the pool to another position for your review! The same goes for potential choices of materials. You can try out different colors and options for your deck, interior finish, perimeter coping, and most any other features that will go in and around your pool. For example, you can see how brick coping will look with a stamped concrete deck in a particular color, and within seconds, see how it would look with flagstone coping and a paver stone deck. You can also test drive additional features and see how they integrate. Maybe you are not sure if your outdoor space is a bit too tight to include a full outdoor kitchen. With virtual reality, you can check this out ahead of time and confirm your suspicions—but also learn there is plenty of room for a great island grill. Being able to try out potential features and creative inspirations and make changes on the spot is powerful. This tool saves time and makes it easier for you to review options and make more informed decisions when there are so many choices to make. When pool designers use 3-D modeling software, they can present a detailed, virtual reality representation of what your investment will look like—and in some cases, how various features will function. Words describing this program don’t do it justice: Check it out for yourself with these three example presentations. Tour your new backyard before it is even built. Doing so gives you a much deeper understanding of how the final result will come out, and it facilitates important design and location decisions. You can request to see different features, materials, and positions, and your designer can quickly make changes so you can see which options best fulfill what you seek. As you embark on planning a new pool and backyard, ask potential pool builders if they offer digital design presentations, and watch as your backyard dreams take shape before your eyes.